Winter Arcades Project. This Friday, 5-9pm. 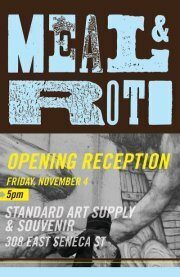 Taking place at Standard Art Supply & Souvenir during Ithaca’s First Friday Gallery Night. Nice write up in this week’s Tompkins Weekly. And, in this week’s Ithaca Times. 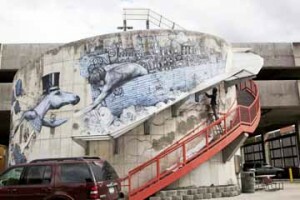 French public artist Roti paints mural on the Green Street parking garage. Posted: Wednesday, November 16, 2011 12:00 am | Updated: 3:50 pm, Wed Nov 16, 2011. Since arriving in Ithaca almost one month ago, the 23-year old French street artist who goes by the name Roti has painted six murals in town – three at private residences, and three large-scale public works – each containing elements of fantasy architecture enlivened with imaginative creatures who are often portrayed in transit: whimsical caricatures pointing toward a departure from human absurdity. On the side of the building in the West End at the intersection of Taughannock Blvd and Seneca Street, a giant fish rises from a castle (or some other Palladian pile) as it attempts to catch a ball in its mouth, and on the old Green Street parking ramp next to city hall, a flying top-hat wearing horse and his Alice in Wonderland she-wolf companion are about to be hoisted aboard a great flying ark. The latter mural was, for the record, created at the invitation of Ithaca’s Public Arts Commission. The most recent piece, a large painting on the east façade of the newly opened Standard Art Supply and Souvenir on Seneca Street represents a collaboration with a British graffiti artist called Meal, who has lived in Ithaca for the past six years and whose outdoor mural work can be found at sites such as GIAC, AJ’s Foreign Auto on Cherry Street, and the Ithaca Skatepark. In conjunction with their recent collaboration, the two artists currently have a dual exhibit on view at Standard Art. Taking some time to talk with us after a mind-bogglingly productive spurt of artistic output, we asked the pair about their origins as artists, what inspires them to work in the street, and what would be their ultimate surface to paint. Read the entire interview by clicking this link. On Friday, Dec 2, the newly-opened Standard Art Supply and Souvenir at 318 E. Seneca St.will be transformed into an experimental marketplace of literature, art, and design, when local and regional independent presses, makers of art books and editions, conceptual artists, and indie craft vendors will convene to offer visitors an alternative and thought-provoking shopping experience. Taking place during December’s Downtown Gallery Night, the event will offer gallery visitors and holiday shoppers a chance to purchase affordable and original works of art and literature. Expect to find original titles by local and regional presses, art books, book arts, zines, mobiles, jewelry, silkscreened t-shirts, artist prints, as well as a number of original artist-made puzzles and games. Vendors include Ithaca City of Asylum, Sunnyoutside, A-Jump Books, Stockport Flats, Louise Felker, Preacher’s Biscuits, Lauren Valchuis, Essay Press, Werner Sun, Kaleb Hunkle, Essays & Fictions, and Josh Sperling. 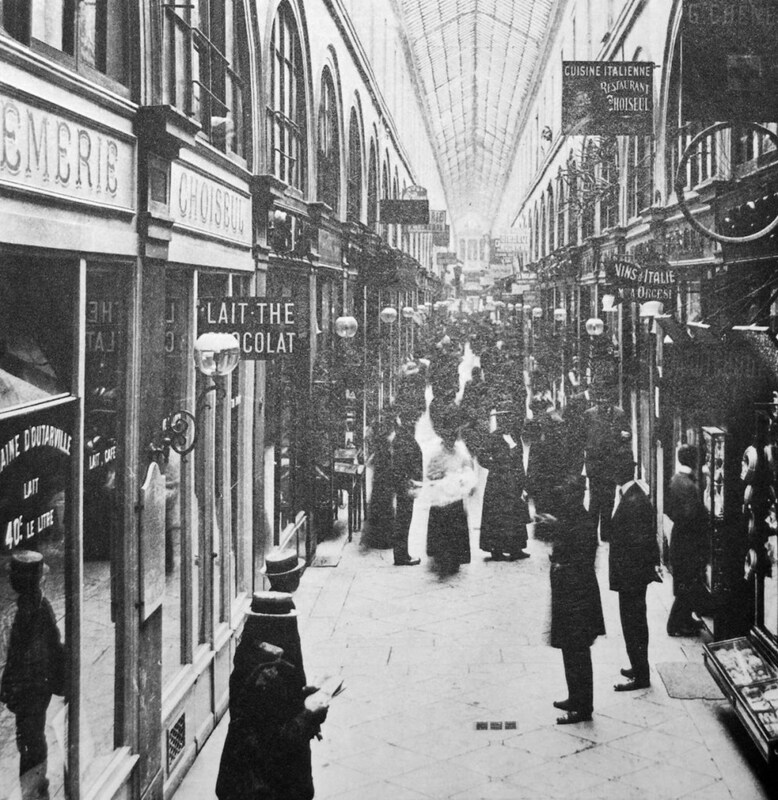 Arcades Project also will host a curated series of works by selected visual artists who creatively explore the relationship between visual arts and the marketplace. Works include a performative interactive market stall by local artist Ben Altman who will invite visitors to barter using silk scarves screen printed with original works of photography, as well as Buffalo-based artist Alexander Derwick whose interactive virtual video-game titled ‘The Domestic Animal Entertainment System (DAES)’ will offer visitors a chance to travel throughout the Arcades Project space while hooked up to a video game which enables the viewer/gamer to safely experience ‘a range of fantasies from our universe’ in a simulated version of an internal world. During the evening, Derwick also will offer an interactive scavenger hunt. 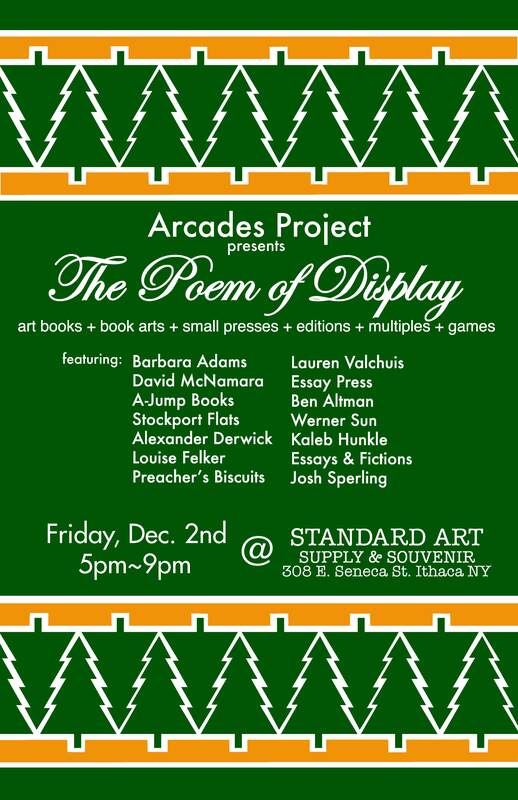 The event will take place on Friday, Dec 2 from 5 to 9 pm at Standard Art Supply and Souvenir, located at 308 E. Seneca St. ArcadesProject is founded by Danielle Winterton and David Nelson Pollock, founding editors of Essays & Fictions Press, artist Karen Brummund, and local art critic Wylie Schwartz. The Finger Lakes Wine Center is seeking artists for Downtown Ithaca Gallery Night for December 2nd. Artwork will be mounted on display wires or on easels. The show will remain up until December 10. If you are interested in being a part of the show and would like to submit digital samples of works for consideration, please email manager@fingerlakeswinecenter.org. The Wine Center will continue to present shows for Gallery Night throughout 2012. For more information call 607-882-9663 or email the address above. The Arcades Project team (including yours truly) is excited to announce that we will be holding the next installment of Arcades Project at Standard Art Supply and Souvenir, located at 308 E. Seneca St next to The Shop. The event will take place on Dec 2nd during Gallery Night from 5 to 9pm and will offer holiday shoppers a chance to peruse and buy affordable, original works of art and literature with a variety of indie crafts, oddities and curiosities. I visited the space again this past Friday for the new show that is up – a collaboration between Roti, the French Muralist I wrote about in a previous entry as well as an English artist who calls himself MEAL – who exhibited a series of drawings and paintings in their unique style of street art as well as one intriguing and inventive work of sculptural assemblage made from paint cans and other bits and bobs, and included a series of abstract paper multiples which stretched from the east wall, up to the ceiling and back down to the piece, making the art space and gallery space indistinguishable – a very Daniel Buren early 1960s dawn-of-conceptualism kind of institutional critique which was invigorating to see at a local gallery. Plus where else other than in art do you see an Englishman and a Frenchman working so nicely together – exciting to have it all happening here in Ithaca. Not to mention the mural created by the duo on the east wall outside the gallery is another scintillating addition to Ithaca’s public art offerings. Beginning this Thursday Standard Art Supply and Souvenir will be open 10-7 THURS- SAT Sun 10-5 Tuesday & Wed 12:30-7. Closed on monday. Definitely stop by and check this show out. I am excited beyond belief to have this space as part of downtown Ithaca’s gallery offerings, and especially that we will hold our next Arcades Project there.